What a lovely review! I'm very proud of my sister and the book that resulted. It was very much a labor of love and I think it's evident in the book. 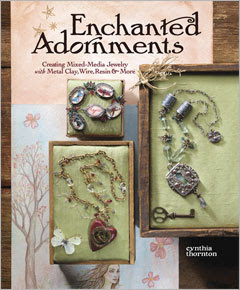 I think one of the great things about the book is that Cynthia encourages the reader not to just duplicate the pieces, but to use them as a spring-board for their own ideas and inspirations. Like you said in your review, each project is easily adapted to the needs and desires of the reader. I'm SO happy to see it finally. Months of work finally crystalize to create what I think is a masterpiece that belongs in every jewelry-maker's library! I'm so proud of her too, Andrew, and of YOU for being such a support to her while she was working on it. It is a truly lovely book that you can both be proud of! I'm a big fan of cynthia's work - I'll look out for the book.